A shot of the Blue Bridge and downtown Grand Rapids. Grand Rapids gets gold for its green initiatives from renewable energy and an urban tree canopy. 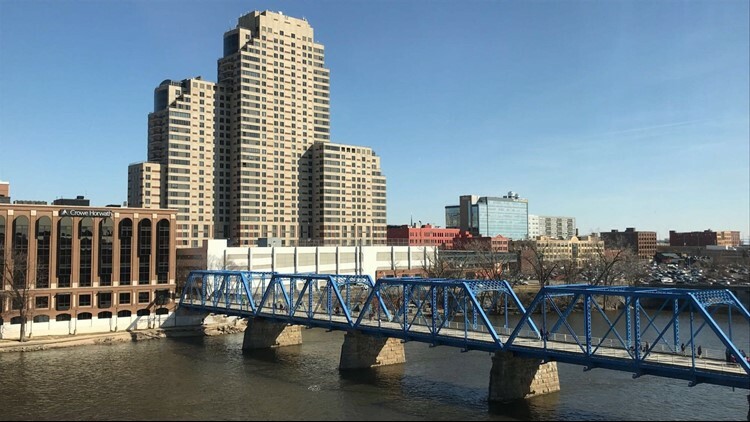 GRAND RAPIDS, Mich. - The City of Grand Rapids has earned a gold certificate for taking on a wide range of environmental sustainability projects in the Michigan Green Communities Challenge. The projects include everything from renewable energy to an urban tree canopy. The award from Michigan Green Communities Network's (MGC) acknowledges clean energy and environmental leadership through training, education and communications. It is a partnership of the Michigan Municipal League, Michigan Association of Counties and Michigan Townships Association. In addition to honoring Grand Rapids, the Michigan Green Communities Awards recognized 29 other communities Sept. 20 at its annual workshop, which took place in Grand Rapids.